Although it is difficult to fix a pickup itself and is best left to a professional in most cases, you can check several areas related to the pickup to see why it is not functioning or functioning improperly. Many experienced guitarists are able to troubleshoot and repair their own pickups, but you can also make sure that the wiring and electronics are in order as they are necessary for a properly functioning pickup. Unscrew the control cavity cover. In the control cavity, the electronics are accessible as well as the knobs for the pickup. If there is a problem with the sound of the pickup or it is not working properly, here is the best place to start. If there are wires that have come loose or the electronics are not working, you will need to use a soldering gun to reattach the wires or to remove the module to repair or replace. Unsolder the leads that go to the pickup to remove it to have it fixed or replaced. Be careful to not burn the leads on the pots and be very careful as you remove the wires. Make sure to mark each wire and note where it must go so that you do not wire them back incorrectly. Remove the strings as this is the best way to get to the pickup if you must remove it to be repaired. Unwind each string using the tuners on the head stock and slide them out of the bridge when each end has been taken off each tuner. 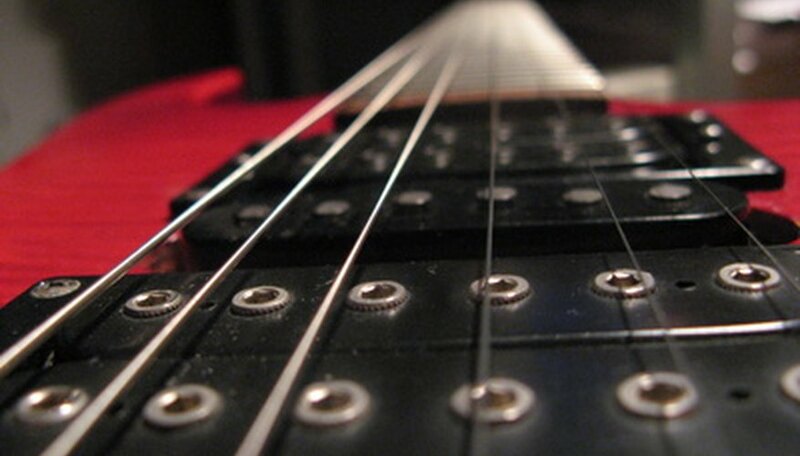 Remove the pickup from the guitar body by loosening each screw. The screws hold the pickup down, and if you loosen them all the way, the pickup will pop right out. Make sure that the wires are unsoldered before trying to remove the pickup or you will break them. Inspect the wires; usually this is the reason why a pickup is not functioning. If the wires are cut or have rubbed against the wood and exposed the bare wire underneath, you can attempt to rewire the pickup. If the sound is functioning but it does not sound right, there may be a problem with the pickup itself. Remove the ribbon around the wound wires of the pickup. You will see some epoxy and the wires beneath. Look for damage to the pickup or wires. You can rewind the pickup yourself or send it out to a shop for repair. If the pickup is enclosed, you may have to send it back to the manufacturer for repair.